Wisconsin Counties, 2010. View the original source document. There are approximately 200 modern reference maps available of basic cultural and geographical data about Wisconsin and its history. The maps are primarily intended for teachers, students, and others needing answers to simple questions such as: Where were Wisconsin's Indian tribes when the first white explorers arrived? What parts of the state did German immigrants settle in? Where were Wisconsin's first roads? Can I print a map of all Wisconsin counties and county seats? All reference maps are available online. To find maps on a particular topic, enter a specific search term such as "Norwegians" or "rivers". View online reference maps in the Society's collections. Ninety-one maps were scanned from "Cultural Resource Management in Wisconsin" (1986). Subjects include: agriculture, fur trade, religion, social & political, transportation, industry, government, settlement and education. 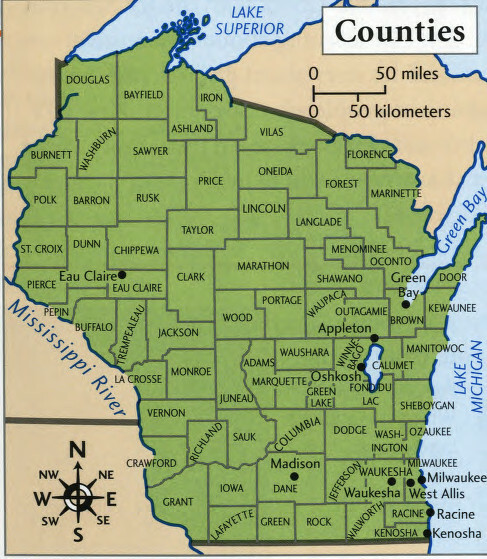 There are also maps from "Wisconsin: Our State, Our Story" (2008), the Wisconsin Historical Society's elementary school history textbook. Subjects include: Blackhawk's route, fur trade routes and tribal lands. Ninety-six maps were scanned from "Origin and Legislative History of County Boundaries in Wisconsin" (1942). 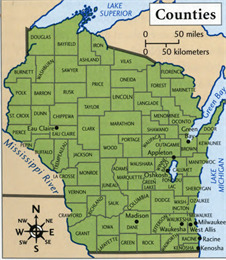 All Wisconsin counties are represented based on the General Land Office township and range system. The maps show the precise boundary of every Wisconsin county at any point in time. The original book was crudely printed by mimeograph and the scanned images accurately reflect the quality of the original work. There are also maps from "Wisconsin: Our State, Our Story" (2008), the Wisconsin Historical Society's elementary school history textbook. Subjects include: counties, glaciers, topography, longitude and latitude markers and waterways. The reference maps were compiled from numerous sources for online retrieval only. They are not available in one location physically. Photocopies of documents are available for a fee. The State Cartographer's Office is a clearinghouse of information on maps and geographic data about Wisconsin.